BMW's second generation X3, sold between 2010 and 2017, is premium mid-sized SUV that's a larger, plusher and more powerfully efficient choice than its predecessor, stacking up impressively against prestigiously-badged alternatives from Audi and Volvo in this sector. Like its rivals, dynamically targeted almost exclusively towards on-road use, it's another example of just how car-like a model of this kind can be. It isn't often that BMW gets it wrong - and even when it does, it usually still manages to turn a profit. The brand's MK1 model X3 mid-sized SUV was a case in point, launched in 2004 to more affordably extend the reach of this Bavarian brand's road-biased SUV model range following the success of the larger all-conquering X5. But early first generation X3s felt cheap, rode poorly and, even by the modest tarmac-orientated standards of the class, were woefully short of any kind of off-road ability. Later MK1 models were better, but what was really needed - particularly in a market by now crammed with premium alternatives - was something much classier, much more. X5-like. Something indeed, like the car we first saw at the end of 2010 - this one, the second generation X3. This design was the size of a first generation X5 and was built at the X5's US Spartanburg factory. At launch, BMW's clam was that it would ride and feel just like that car. It competed against tough premium mid-sized SUV rivals like Audi's Q5 and Volvo's XC60. The MK2 X3 range was facelifted in 2015 and finally replaced in the Autumn of 2017 by a third generation model. Most buyers will be happy with one of the xDrive 20d models. Prices for this popular diesel variant with base 'SE' spec typically sit in the £12,400 to £17,300 bracket for a 2010 to 2014 model year 184bhp car, depending on mileage, year and spec. 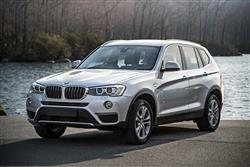 For a later '15 or 16-era 190bhp X3 xDrive 20d SE, you're looking at around £21,250 to around £24,500. There's a saving of about £1,200 or XDrive 20d pricing if you go for lesser 143bhp 2WD sDrive 18d diesel model. We'd try for one of the plush Sport or M Sport variants. If you're interested in one of the pokier auto-only six cylinder diesel variants, prices start from around £15,300 for a 258bhp '16-plate xDrive 30d SE, rising to around £24,500 for a later '16-era car. For a 313bhp xDrive 35d SE, prices start from around £18,200 for a '12-era model, rising to around £24,25 for a later '15-era car. Our ownership survey uncovered a number of satisfied customers, but also a number who'd had teething issues. One car exhibited a knocking noise from the front right, traced to a faulty steering rack. In fact, no fewer than four replacement racks were needed on that particular model; apparently, it's due to a design fault. On owner reported a buzzing sound from the back end of the car, while another talked of transfer case whine (a £2,000 fix) and yet another said he'd noticed occasional screeching from the engine. Look out for all these things on your test drive. Other failures related to the front door latch, the rear boot latch, the trip computer, the tow bar and the Bluetooth module; check all of these. One owner found his car's front brake discs needed prematurely replacing. Another reported a rattly sunroof and door seals that squeaked. As usual, make sure that servicing has been correctly carried out at a BMW main dealer. Given this X3's 'crossover' rather than full-SUV status, it's unlikely than any given car will have been subjected to any off-road heroics, but check around the sills just in case. Kerbed alloy wheels and signs of interior child damage are much more likely. Use these as negotiating points with the seller. Settle behind the wheel and get ready to punch the starter button and you've that pleasant compromise between a perch that's higher than it would be in an ordinary saloon, yet one still low enough to make you feel a part of the whole driving experience. The X3 range was an all-diesel affair in MK2 guise, with the majority of buyers opting for the four cylinder 20d xDrive variant, initially offered with 184bhp, the engine later uprated to 190bhp. In 2012, a 2WD sDrive 18d variant using the same engine de-tuned to 143bhp was added to the range. Two auto-only six cylinder xDrive models were also offered, a 258bhp xDrive 30d and a 313bhp xDrive 35d. BMW has always been proud of this model's xDrive permanent four-wheel technology, but as you might expect, the engineering behind it was mainly devoted to the business of making this mid-sized SUV handle just like a BMW 3 Series Sports saloon. Certainly, the way that this electronically controlled system can distribute torque as needed to all four wheels depending on the grip at either front or rear will be useful in a snowy snap. It's really there though, to make ordinary, everyday tarmac motoring that bit more enjoyable, helping to control the car through bends by, in true BMW style, sending more power rearwards and, if necessary, even lightly braking the inside rear wheel in tight cornering to increase mid-bend agility and traction. As for the rocky ride that owners of the MK1 version of this model might remember, well things are much improved here, with a redesigned independent set-up offering a far more compliant set-up. Indeed, it's one you can exercise some control over yourself if you get a car whose original owner ticked the extra cost box for the Variable Damper Control that comes with BMW's Drive Dynamic Control System. Here, you can switch between 'Normal', 'Sport' and 'Sport+' modes via this dashboard button, allowing the electronics to adjust the character of throttle settings, engine response and DSC stability control thresholds, depending on the road you're on and the mood you're in. The system also alters power steering weight, which you might feel will make unnecessary the further extra cost options of Servotronic or Variable-ratio sports steering that offer fingertip-lightness when parking but greater feel through faster corners. We should also mention that the Variable Damper Control can also alter the characteristics of the optional 8-speed automatic transmission, the gearbox many original owners chose. Try an X3 with the satisfyingly slick 6-speed manual 'box first before committing to it though. What else? Well refinement is exemplary on the motorway, while at the other extreme, this car will cope quite happily with muddy tracks that don't trouble the relatively shallow ground clearance. And in the unlikely event that you're tackling a steepish, slimy slope, a Hill Descent Control system will allow you to pick your way carefully down it. This X3 came of age in second generation guise, an immeasurable improvement over the MK1 version in every possible way. Even the best of this car's prestige rivals from this era struggled to match this one's hugely impressive blend of performance and efficiency. It feels up-market, it rides impressively and, thank goodness, on-tarmac, it drives just as a BMW should. All of which means that used SUV buyers in this sector who can afford the asking prices should find that this X3 adds up very nicely indeed. Assuming that they don't prioritise off road ability of course, but then in that case, it's fair to ask whether a larger but more conventional 2WD BMW 520d Touring for around the same kind of money wouldn't be a better bet. It comes down to personal preference - and we're guessing that's a choice you'll enjoy making.